In this article, I will show you, how we can have multiple contracts in WCF service. 1. There are three contracts. 2. All contracts are being implemented in same service class. 3. Each contract is exposed on different end points. Create a WCF Service Application. Already by default IService1 contract is being added. Add two more contracts. Right click on the project and select add new item and then choose Interface from Code tab. 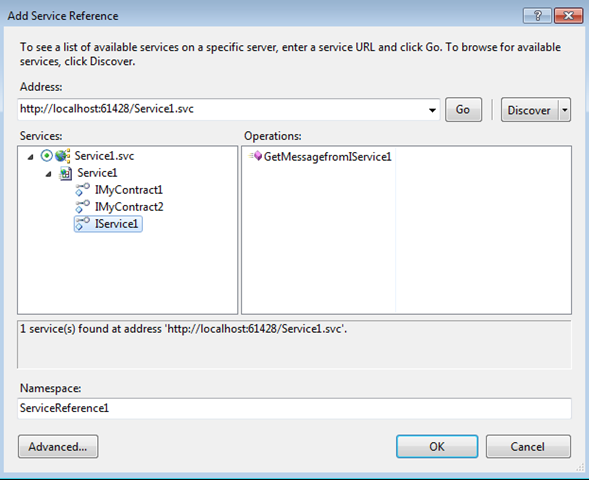 Implement the contracts in same service class Service1.svc. All the function is just returning a simple string. 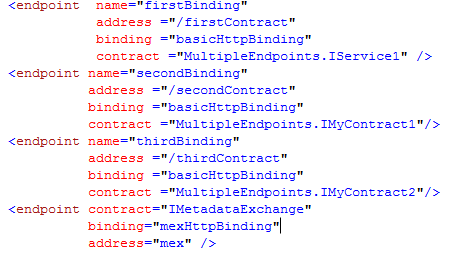 If you see the above end points configuration, different contracts has been exposed on different endpoints. Address of the end points is given as relative to base address. And each end point contains a unique name also. Address is unique for each end point. Press F5 to run the service. Once service is up and running, we are ready to consume the service in client. Create a Console application as client. Add the service reference of the service. Now you can see, there are three proxy classes have been generated by WCF. 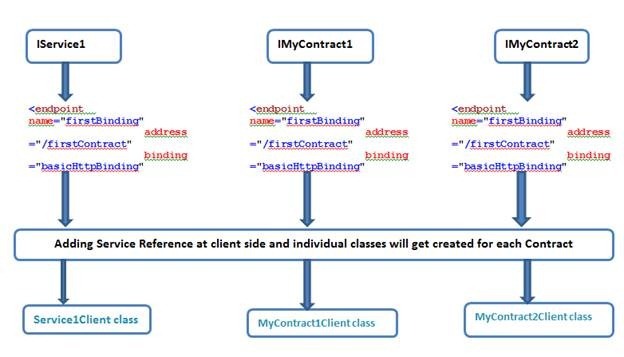 Each class is corresponding to each service contracts exposed by the service through the end points. You can see three service contracts have been exposed to the clients. Above block diagram says the all that, each contract is exposed on different end points. And WCF created corresponding class for each contracts. Thanks for reading. I hope article was useful. Happy Coding. also help me to complete my task. Sir I tried this example with multiple service contracts but it is showing error. can u send me a sample project on my email id. I need it urgently. That will be a grt gesture.